During five war patrols under the command of Commander (later Rear Admiral) Richard. H. O’Kane, the Balao class fleet submarine U.S.S. Tang was credited with sinking a total of 31 Japanese ships, for a wartime total of 227,800 tons. The victim of a circular running torpedo during her fifth war patrol, only nine members of her crew, including O’Kane, survived to spend the rest of the war in Japanese captivity. This volume contains the complete text of Tang’s five official war patrol reports, the fifth completed from memory and filed after the end of the war and O’Kane’s release from a Japanese POW camp. Also included is an Introduction, the Sailing List for Tang’s final patrol, a list of Allied Code Names for Japanese Aircraft, and an article on the Mark 18 electric torpedo, one of which malfunctioned and sank Tang. The U.S.S. 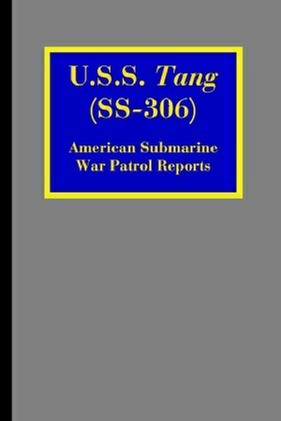 Tang (SS-306) is unquestionably one of the most famous American submarines to see service in World War II. In only five war patrols, she set a number of records. In enemy ships sunk during a single patrol, Tang placed first and third, sinking 10 ships on her third patrol and seven on her fifth. Her skipper, Commander Richard H. O’Kane, holds the record for the most ships sunk by an American submarine commander, with a wartime credit of 31 ships and 227,800 tons. In the category of ships sunk during a single patrol, O’Kane was also on the periscope during the second place patrol, as Executive Officer to Mush Morton in Wahoo. Richard H. O’Kane was born 2 February 1911, in Durham, New Hampshire. He graduated from the United States Naval Academy with the class of 1934. His initial naval service was in the heavy cruiser U.S.S. Chester (CA-27), followed by two years in the old four-stack destroyer U.S.S. Pruitt.